Dispozitive de extractie fabricate din material transparen conform standardelor DIN EN ISO 15528 ideale pentru prelevare si colectare probe de lichide cu vascozitate medie si mica direct din recipiente deschise sau inchise, butoaie, rezervoare, etc. 3- Scoateti dispozitivul pentru eliberarea probei. LiquiSampler for liquids, according to DIN EN ISO 15528. 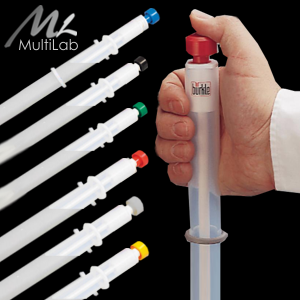 Made of ultra pure and chemically inert PTFE/FEP or PP for contamination-free sampling. Sampling from open and closed containers, barrels, tanks, silos, water courses. Suitable for all commercially available barrels and containers with opening of at least 32 mm in diam-eter. - Push-buttons colour-coded to prevent mix-up, available as optional accessories. - Easy cleaning; all surfaces are free of pores and crevices, preventing accumulation of dirt. 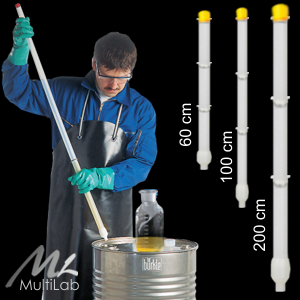 - Only round screw threads proven in foodstuffs hygiene are used. - Disassembly and cleaning are extremely simple. 2- Release the push-button, the valve closes. 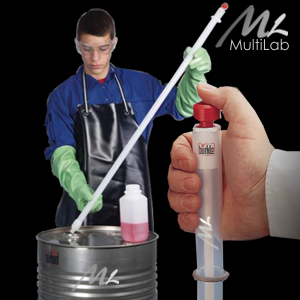 3- Withdraw the lance and take out the sample. 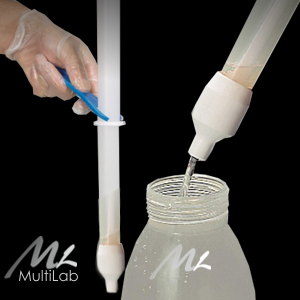 4- Pull out the LiquiSampler, take out the sample.